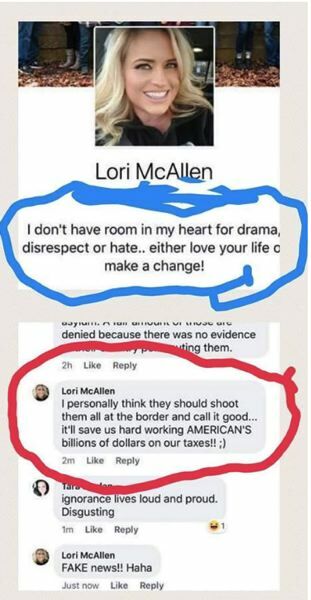 Lori McAllen, a Linn County DMV worker, purportedly wrote on Facebook that migrants should be shot at the border. An Oregon Driver and Motor Vehicles employee who advocated on Facebook for shooting migrants at the border is no longer employed with the Oregon Department of Transportation after an internal investigation into the post. It was unclear Friday whether Lori McAllen, a Linn County transportation service representative, was fired or left voluntarily. Dave Thompson, an ODOT spokesman, said he could not immediately provide those details Friday. "In the last week, we've heard from thousands of people deeply angered by offensive comments linked to an ODOT employee's personal social media account," the agency posted on Twitter. "That employee no longer works for us." McAllen purportedly wrote on her personal Facebook page June 20 that she thought border agents "should shoot them all at the border and call it good. It'll save us hard working AMERICAN'S (sic) billions of dollars on our taxes!! ;)"
McAllen appeared to have made the comment in response to another social media post criticizing the Trump administration's decision to criminally prosecute migrants for crossing the border without prior authorization, according to screenshots of the post shared on social media. Thousands of callers and commenters urged ODOT to fire McAllen for the post, and the incident has drawn international media attention. ODOT officials placed McAllen on paid administrative leave June 21 pending an investigation into the post. She had worked at the DMV for about 10 months. In a series of tweets Friday, the agency reiterated that "statements like those in the offensive post have no place in civil service and stand in direct conflict with our values which are borne from the following: integrity, safety, equity, excellence and unity."